Crafts that can also be Gifts! This category contains a wonderful variety of crafts that would also make great gifts! Some can be made independently…Some will require a little help. You’ll find these projects are adaptable to most seasons. To make the paints stick to the glass, first mix the colors with some glue. Keep the paint thick so it won’t run. Use brushes or cotton swabs to paint a design on the jar. To erase a mistake, use a paper towel to wipe off the paint before it hardens. LET THE PAINT DRY, then seal the finished design with a coat of glaze. Paint children’s’ hands and place them on a 6×6 ceramic wall tile (You can usually get them donated through a home repair store). Write the child’s name at the bottom. After 24 hours, put a sealer on the tile. Empty, clean Altoid mint tins (other brands will do), acrylic paint, Paint brushes or sponges. Decorative options: Ribbon, buttons, craft foam shapes, pom-poms, photos, magazine cut-outs, glitter glue, feathers…the possibilities are endless! First paint the tins using acrylic paint. After the paint is dry, it’s time to decorate. You can use a glue-gun, glue dots, craft glue or even sticky backed craft foam! It’s that easy! Fill your new tins with barrettes, paper clips, earrings, postage stamps, lost buttons or make a mini-sewing kit for traveling. It works nicely as a SMALL FIRST AID KIT for the car! Paint the tin white–when dry add the large red cross in the center Fill it with some “FIRST AID SUPPLIES”. I used sticky-backed red craft foam to make the cross, so no glue was necessary. Then, I filled the tin with Tylenol type tablets, disinfectant wipe and a couple bandages. Save the stubs of candles. When you have several saved, melt them together in a double boiler. Color the wax by adding bits of crayon to the mixture. Pour the wax into glass jelly or mason jars– or metal cans. Use cotton yarn for wicks, or you can purchase a roll of wick at a craft store. Decorate the outside of the candle holder with acrylic paints. Have children roll the dough into bead shapes. Insert a large nail through each shape before baking. When the shapes have cooled—remove the nails and have children string the beads to make necklaces. Good for making gifts! In a bowl, mix together 2 cups flour and ½ cup salt. Stir in ¾ cup water. Knead the mixture for 8 to 10 minutes, until it is smooth and pliable. If the dough is too dry, add a few drops water. If it is too sticky, add a small amount of flour. Have children mold the dough into shapes and press in decorations when desired. Place the decorated shapes on a baking sheet and bake them at 300 degrees F for about 4 hours, or until hard. If desired, when shapes are cool and dry, spray the painted or unpainted shapes with a clear fixative—in an area away from youth. Gradually add warm water until the mixture can be kneaded into shapes. An adult shouild supervise so the mix doesn’t become too watery. Form beads by breaking the dough into little balls and rolling it to the desired shape. Pierce the balls with toothpicks. Allow the balls to dry. When dry, paint and string the beads. Take a piece of a jigsaw puzzle, or several pieces glued together, paint it and decorate it with beads, glitter, sequins, etc., Glue a jewelry pin on the back. Remember those fluffy scrunchies from the 80’s and 90’s (the material on an elastic band) that so many of us used to make our pony-tails? Collect all you can for this fun spring/summer craft or gift. For each flower, wrap 1 or 2 COLORFUL HAIR SCRUNCHIES around the top of a pencil. Lightly etch leaf vein lines in the foam with the tip of a toothpick. Using a hole punch, make a hole in the base of each leaf. 3. When pennies are dry— fit, cut, and glue felt to the bottom. Directions call for “un-opened facial tissue box”. 1. Take the box and glue pasta shapes all over it–except the opening at the top. Make a TERRERIUM OR SEASIDE SCENE inside a small to medium glass vase. Use pebbles, green moss, fall foliage, twigs, small pieces of wood or stone for the EARTH TERRARUIM. Or use beach sand, shells, small pieces of driftwood, the small discarded shell of a crab, etc., for a SEA SCENE. TIP: Put small glass vases in your wish list! I imagine that your parents have quite a few vases in their cupboards that they could donate–I get a couple every year with gifts of flowers. Lay several craft sticks on the wax paper, next to each other and touching. Be sure to line them up evenly. Use two more craft sticks and glue on top of the others, one at each end, to hold the rest together. They will look similar to a fence or log raft. Use two more craft sticks –and glue ends of stick– to the ends of the sticks that are already in place, so that they create a square. Keep repeating this alternating process to build up the sides as high as you would like. Make the lid by repeating steps 1 & 2 above. Let everything dry completely. You can leave your box plain or paint it. You can also add a shiny effect by painting on a layer of glitter glue over white paint. Glue a bead or stacked matching buttons to the center of the finished lid as a handle. You can further embellish your jewelry box by decorating it with craft jewels. Clean the jars well and let dry. You can use small jars…but check the size of the votive candle to make sure it will fit. Have the children brush glue onto the jar and place different colors of tissue paper over the glue, overlapping so the entire jar is covered on the outside. When brushing the tissue with glue be sure to do so gently so it doesn’t tear. If it tear, remove or leave wrinkled. The glue will appear to be white but will dry clear and when a candle is lit inside will give off a pretty color and design. ROCK ART are great gifts for people. They can be used as paper weights, decorations for indoor gardens or masterpieces to be shown throughout the home. 1. Gather various shapes and sizes of rocks found at parks or along beaches or in your own background. All sizes and shapes are perfect for rock art. 2. Clean the rocks and air dry. Choose crayons in three or four light or bright colors. Dark crayons will make the color on the rock look muddy. Peel the crayons, put them in the zip-to-close bag, and seal it. Place the bag on a hard surface such as a floor or sidewalk. Using the mallet, pound the crayons into small pieces. Place the rock in the pie tin or on a sheet of aluminum foil in the hot sun. Sprinkle it with the crayon pieces. When the crayon pieces have melted, but before they reach the point that they run off the rock, take the rock out of the sun to cool. The crayon will quickly harden and form a colorful and waxy coat over the rock. Cut a piece of felt to glue to the bottom of the rock to keep it from scratching the table. IF WEATHER ISN’T HOT— Preheat the oven to 350 degrees. Place the rocks on a foil covered cookie sheet and put them in the oven for the children. Keep an eye on them because the crayon melts quickly. It will re-harden within seconds of taking it out of the oven. To do outside—this project needs a hot, direct sun.. If you’re unhappy with the color of a crayon-coated rock–Reheat the rock and allow the crayon to melt to the point where most of it drips off the rock and onto the foil under it. Cover the rock with a new selection of crayon bits and see if you get a swirl of color you like better. Remember to avoid dark colors. ……A goal is to get it looking like a tie-dyed rock! The distinct lines of color can be very beautiful. Because the rocks can be easily redone, remember not to place the completed ones that you like in a sunny window or direct, hot sunlight because they will re-melt. Try sprinkling crayon bits on the indented end of a metal lid from a frozen juice can. After crayon has melted and dried, attach a piece of sticky-back magnet to the back of the lid and put the colorful crayon magnet on the refrigerator. Cancelled stamps from your mail; small colorful pictures from seed catalogs and magazines may be used instead of stamps. Wash, rinse, and dry rocks. Carefully peel off stamps from envelopes. It’s O.K. if some tear. Arrange stamps (or small pictures) on rock, OVERLAPPING, until all rock sides showing are covered. Let dry. Coat with thin layer of shellac or varnish, or fingernail polish. NOTE: You can also coat the finished rock with a thin layer of white glue. It will dry clear, but it will not be waterproof! If this is a gift, make it in the person’s favorite colors. Take the paper label off the container. Line up a Popsicle stick, straight up and down, so that the bottom of the stick is just touching the bottom of the container and the top of the stick goes just over the top of the container. Glue in place. Glue another Popsicle stick next to the first one– then repeat until you have glued on Popsicle sticks all the way around. Leave natural or paint the Popsicle sticks; use any color except green if you’ll be painting on green leaves. Paint flowers or decorated as desired. Artwork can be transformed into useful place mats or coasters for children and family. Use existing artwork or have children design something special. For place mats, have children draw, paint or color a picture on a large piece of paper, then laminate it or cover it with clear contact paper. For coasters, children could trace templates on colored paper and laminate. Don’t forget to sign and date the back! For each napkin ring you will need a chenille stem and several colorful beads. Have children twist the ends of each chenille stem so that a 2-inch circle is made to hold the napkin. Thread colorful beads on each end of the chenille. Cut off the extra chenille stem as needed; have children experiment with bending and twisting the ends of the chenille stemsas the beads are added. 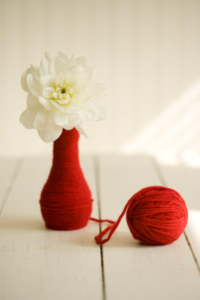 INTERESTED IN MAKING TP TUBES AND YARN NAPKIN RINGS? Visit the Christmas Craft Category–near bottom of Page 4 for directions. They’re not only for the Holidays-but can be made in any color for any season! Make fun bookmarks with construction paper, markers, paints, and stickers. You can also use glitter, sequins, lace, doilies, buttons, and any other odds and ends you have left over form other projects. Cut strips from construction paper, painting the construction paper will make it sturdier, or you can visit the local library or office supply to have them laminated for longer lasting use. To complete the bookmark, attach a tassel make from strands of yarn. Decorate several sheets of paper and envelopes to give as stationery. Use glue and glitter, crayons, markers or paint for borders; or cut out pieces of sponge, dip them into paint and make stamps on the paper. Take a nature walk on a clear, dry day. Collect any attractive flowers, leaves, grasses, and herbs. Separate each stalk or blossom. Place each one separately between the pages of the phone book, spacing them well apart from each other. Place the phone book in a cool, dry place for a week to ten days. Your leaves will then be totally dry and ready for use. Carefully apply craft glue, just a dab, to the back of the dried leaf or flower. Center it on a note card for a single design or place several as a collage on a sheet of watercolor paper, which can later be framed. A note card that used the fragrant language of flowers conveyed more than words. Mix up the Plaster of Paris according to package directions. Give each child about 1 cup of the mixture and have them form it into a lump with a flat bottom. Quickly before it hardens have them stick the nuts, bolts, etc. all over the lump. Leave it to harden overnight and then spray with silver paint. Last, cut out a piece of felt and glue it on the bottom. Glue child’s photo on the block of wood using the podge type effect. On the back of the wood have a card printed with ‘A Chip Off The Old Block’. Have children mold pieces of dough into small bowl shapes. Decorate the bowls by pressing colored pasta pieces and dried beans into the shape. Bake the bowls with decorations in place. WIND CHIMES MAKE WONDERFUL GIFTS. For Windsock and Wind Chime ideas..
Have each child paint or finger-paint a design on paper. When dry, cut the paper to fit around the tin can. (Make sure there are no sharp edges left on the can.) After reading the following note aloud to the children, have each sign his/her copy and tuck it into their can. It’s for your pencils or your pens. You can show it to your friends. It’s filled with love to you from me. Mom’s could be a sleep shirt! Idea: Paint the bottom of the children’s feet using fabric paint and have them step on the shirt to make footprints. Once the footprints are dry, use black fabric paint and write, “My kids walk all over me”. When painting a shirt for someone…Keep the recipient’s hobbies and interests in mind. For example, if he/she is an avid fisherman, why not make him/her a related shirt? You can make or buy fish-shaped stamps or sponges, dip them in fabric paint, and press a print on the shirt. Since this could be costly–you could ask children that want to make a shirt– to bring one in. If “new” it needs to first be washed. Painting on fabric is done with a special acrylic paint that sets in the heat (Fabric paint) –by ironing or in an oven at 302F. You can also make your own fabric paint by mixing acrylic paint with a mixer. Apply the paint with a brush or stencil brush. The fabric SHOULD BE PRE-WASHED TO REMOVE SIZING/Starch so that the paint doesn’t ‘slip’. Avoid slightly fluffy fabrics when using a paintbrush, it makes the task harder. REFRIGERATOR MAGNETS… Take small wooden shapes; paint them or decorate them with other supplies. Glue a small magnet strip on the back. Paint pictures or designs onto a plain clay flower pot. Give just the pot or fill it with some goodies. These are also nice painted to a Theme…such as Halloween…and then filled with candy corn or ____ for a center piece. Make Scarves: This is a craft that requires only the fleece fabric & a good pair of scissors! The pictures are not mine but shows you exactly what I’m talking about.Our students made warm scarves by buying lengths of micro-fleece and simply cutting them into strips. The end was then cut into fringe. The fleece does NOT unravel so does not need any sewing. DECOUPAGE COOKIE PLATES…The sample image made by KidActivities.net uses winter ‘Holiday’ wrapping paper–however, the drawing or gift wrap used can be geared to any time of the year! It would be wonderful gift for Mother’s Day, Easter, Valentines Day, or Thanksgiving! 1. Trace around a plate. Cut out the circle. 2. Make a colorful drawing on the paper circle. 3. Brush Mod Podge onto the back of the plate. 4. Press the picture onto the back of the plate. 5. Press out any wrinkles. 6. Let the plate dry. Apply another coat of Modge Podge if desired. 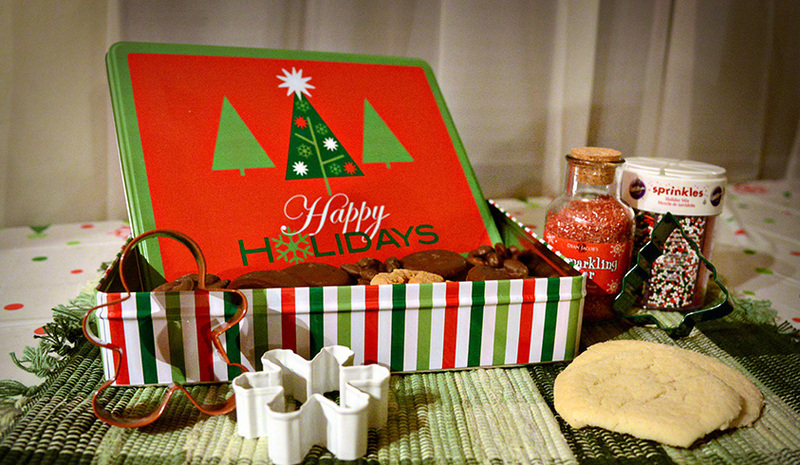 If you’re an adult and making on this for a gift-fill this plate with cookies you have made! Cover with colored cellophane and ribbon. NOTE: Krylon spray was also used on the back of the plate for added protection. If you do this, allow time for any chemical odor to diffuse. Good for ANY season or ANY holiday! 2. Gently lay/apply the napkin over the tile. When napkin adheres to tile–carefully apply one or two more coats over the napkin covered tile. To ensure longevity, Krylon spray was used over each tile. 3. Cut felt piece to fit. If ‘peel off’ is used–just peel and place on bottom of tile. If regular felt used–glue to bottom. Be sure to check out Gift Wrapping Ideas —it could be another fun activity and extend the gift making project!